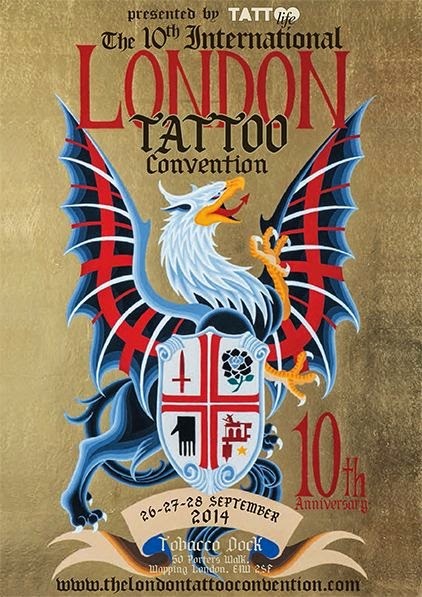 The 10th London International Tattoo Convention, the greatest, most respected and prestigious body art convention in the world, is to be held on 26th, 27th and 28th September 2014 at Tobacco Dock, 50 Porters Walk, London E1W 2SF. 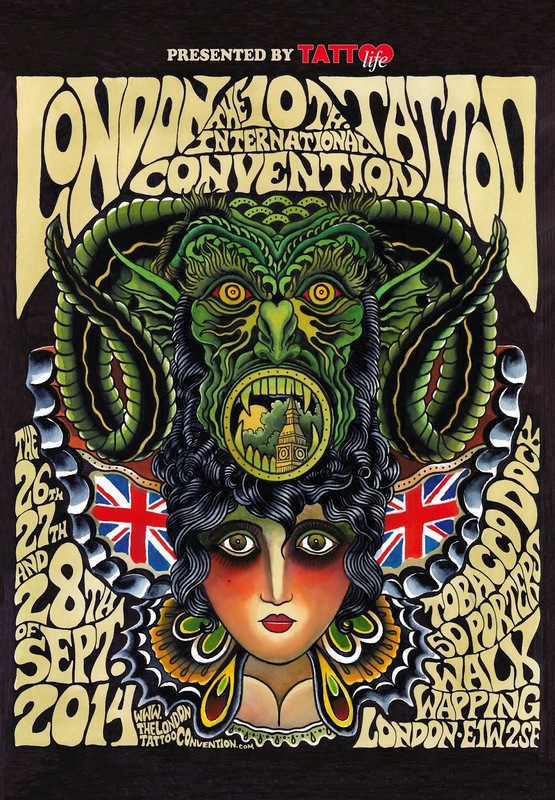 When The London Tattoo Convention was established a decade ago, it was estimated that one in eight of all British adults had been inked. In 2010 it was guesstimated that a fifth of all adults had got at least one tattoo, and now it is estimated that at least a third of all British adults have gone under the needle. It comes as no surprise, therefore, to hear that attendance figures have risen from 3,500 at original venue The Old Truman Brewery ten years ago, to well over 20,000 at the vast, picturesque setting of Tobacco Dock last year. Sabina Kelley an elegant and sensual statuesque platinum blonde pin-up girl with singular grace and style, has been chosen to star as fairy godmother of this year’s convention. A hugely successful international star burlesque artist, originally from Las Vegas, she has featured on numerous TV shows and music videos, and her calendars have acquired massive cult status – and not just for lovers of tattoo art. 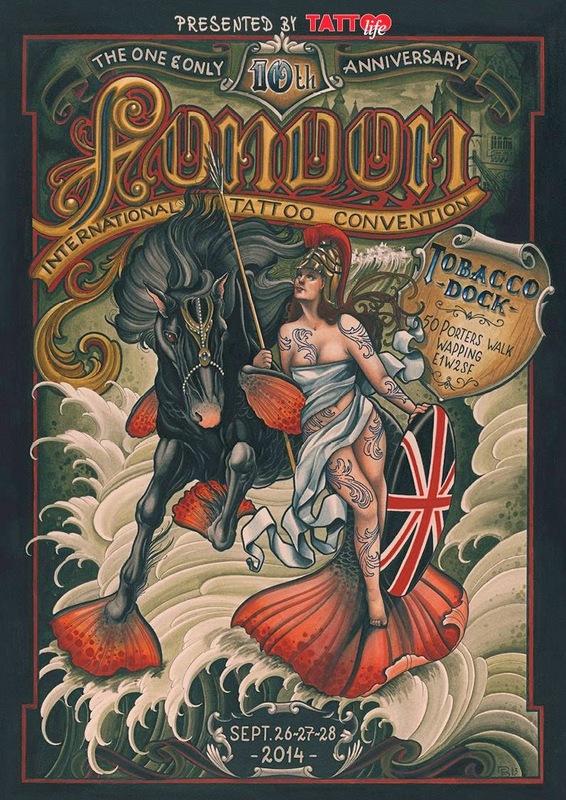 All of the above text and images were taken directly off the London Tattoo Convention website. I'm not feeling all that well today and though I'm excited to pop by after work and see the show, I'm not feeling very wordy. I will make up for it with a recap later on. I will note however that none of the images available for the weekend long event had male models. I wouldn't have said this was a male only type of event, however it is definitely marketed as such. The main stage is dominated by female models and dancers. Thinking about it, despite tattooed male models such as Jimmy Q, are there any that offer other talents and services? I'm awesome at spreadsheets and pivot tables, maybe people would want to see me on the main stage in a vest top reconciling stock figures? It's a pitch I need to be delicate with in the early stages I expect. I will be meeting up with a couple friends, one of which summed up the occasion thusly - "I'm going for the inspiration, and staying for the clunge." Peace.